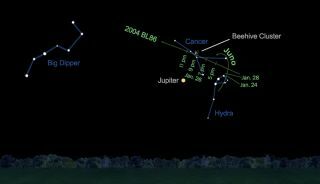 Through large binoculars and telescopes, look for near-Earth asteroid 2004 BL86 as it skims the edge of the naked eye visible Beehive Cluster in late January 2015. You might catch asteroid Juno nearby, but more detailed star charts will be needed. A mountain-size asteroid buzzed Earth Monday morning (Jan. 26) in a close encounter that's already revealing new information about the space rock, including an improved measurement of its size and the confirmation of at least one moon. Asteroid 2004 BL86 came within 745,000 miles (1.2 million kilometers) of Earth — or about three times the distance from our planet to the moon — Monday at approximately 11:20 a.m. EST (1620 GMT). On Monday night, from 11 p.m. to 1 a.m. EST (0400 to 0600 GMT), scientists at NASA's Marshall Space Flight Center in Alabama will observe 2004 BL86 as it recedes from Earth. You can watch a webcast of the asteroid observations here on Space.com, or directly via Marshall's Ustream feed. The asteroid will reach a luminosity of magnitude 9 in the sky Monday, which is bright enough to be seen with binoculars or small telescopes. An image of asteroid 2004 BL86 taken the morning of Jan. 26, the day of its closest approach to Earth, shows a moon orbiting just above the asteroid, and indications of surface features like boulders. This photo was shown by NASA's Lance Benner during a webcast aired by the Slooh Community Observatory. At 11 a.m. EST (1600 GMT) on Monday, the Slooh Community Observatory aired a live webcast discussing new images of the asteroid and its trajectory. During the webcast, NASA scientist Lance Benner showed photos of 2004 BL86 taken earlier in the day using a radar signal from the space agency's Deep Space Network facility in Goldstone, California. The new observations have a resolution of about 13 feet (4 meters) per pixel, and reveal that 2004 BL86 is roughly 1,000 feet (300 m) wide. This is significantly smaller than previous estimates, which put the asteroid's diameter at roughly 1,800 feet (550 m). The new images also show a second object positioned close to 2004 BL86. Benner told Space.com that the second object is a moon, with a diameter between 164 and 328 feet (50 and 100 m). Previous studies of the light around 2004 BL86 had already identified a moon orbiting the asteroid, and the new images confirm that discovery, he added. About 17 percent of asteroids in 2004 BL86's size range have smaller objects trailing along with them. Boulders and other small-scale features on the surface of the asteroid are coming into focus in the new images, as is the overall shape of the asteroid, according to Benner. He compared the object to another asteroid that made a close flyby of Earth six years ago, called 2008 EV5. It appears that 2004 BL86, like 2008 EV5, has an equatorial ridge around its middle, which makes it look "kind of like a muffin, or perhaps a top," said Benner, who's based at NASA's Jet Propulsion Laboratory (JPL) in Pasadena, California. While 2004 BL86 posed no threat to Earth on this pass, it is classified as a potentially hazardous asteroid, or PHA, which is an object that comes within about 5 million miles (8 million km) of Earth. NASA has identified about 1,500 PHAs in the solar system, according to Paul Chodas, manager of JPL's Near-Earth Object Program office, who also spoke on the webcast. Chodas discussed why the flyby is exciting for scientists studying asteroids. "This is like a space mission to an asteroid, only the asteroid is coming to us. So it's kind of a freebie," Chodas said. "We get to see it up close with large optical telescopes. We'll get an idea of its rotation rate, we'll get an idea of its composition […] by taking its spectrum. And with radar especially, we'll be able to get an idea of what this asteroid looks like, up close and personal." The study of asteroids could answer fundamental questions about the formation of objects in our solar system, including planets, the scientists said. Some theories suggest asteroids are responsible for depositing most of the water on Earth. Scientists are also interested in the possibility of mining asteroids for useful materials such as platinum, palladium and water. This will not be Earth's last encounter with 2004 BL86. Chodas said the asteroid will make another close approach to Earth in about 200 years, and will continue to make subsequent close flybys in the centuries to follow. "Now that we have the radar data [of 2004 BL86] from both last night and tonight, we'll be able to predict this much further into the future," Chodas said. "And over the centuries, and as far as a millennia, this asteroid will be approaching slightly closer each time. So it's definitely one we'll want to keep our eye on."